The EP800 automatically calculates worked time between punches and accumulates totals on the card for up to 100 active employees or jobs. It works for pay periods or set to job mode for accurate costing information. 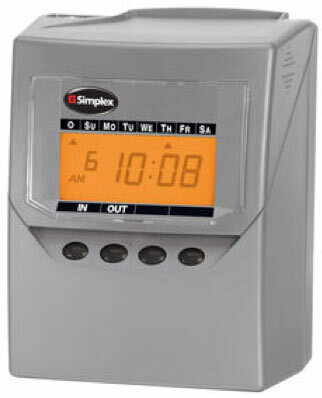 The EP800 calculates actual or rounded time, and supports an automatic break deduction from daily totals. Automatic print alignment, and auto-sensing of front and back of card eliminates operator mistakes and reduces time required to punch in & out. The internal lithium battery maintains the time, card totals and program settings for up to 3 years without power. Optional rechargeable battery keeps unit fully operational for up to 24 hours in case of a power failure.